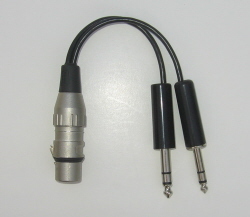 Reverse Airbus Adapter - Avery Sound Company, Inc.
Due to popular demand, we are now offering a Reverse Airbus Adapter. This adapter will convert your Airbus style headset with the 5 pin connector into a standard two plug headset with a PJ068 and PJ055 set of plugs for use on most Boeing aircraft. Our Reverse Airbus Adapter will save you the expense of purchasing a new Boeing compatible headset.